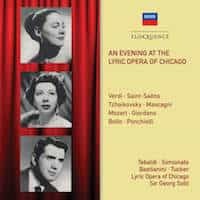 The Lyric Opera of Chicago was founded as recently as 1954, but within two years it had secured the services of many operatic stars of the day, who were doubtless reassured of the quality and warmth of reception at the company by the trailblazing US debut of Maria Callas as Norma in its first season. Sir Georg Solti, too, made his operatic debut in the US not with the more storied Metropolitan in New York but in Chicago, conducting Salome, Die Walküre and Don Giovanni within a fortnight of each other in October 1956. He then returned in November to lead two performances of La forza del destino followed, on the 10th, by a Gala Concert which was recorded by Decca and is now reissued here. Previous Eloquence reissues have restored to availability many of the LP-era operatic recordings made by Solti: not only complete works but recitals and galas such as Solti at Covent Garden (480 8957), and a complementary compilation, \'Solti at the Ballet\'; (480 6589), \'George London sings Wagner\' (480 7064) and early-career overtures with the LPO (480 6588). This live recording has had a chequered career on disc. It was originally issued in 1958, but contractual issues prevented the inclusion of the Chenier duet. The opening Forza del destino overture was sacrificed to accommodate the record of the event on a single LP, and both items were missing from the concert\'s first CD issue in 2009 within a 5CD Decca box dedicated to \'Great Voices of the 1950s\'. They have finally been restored, and the complete recording has been newly remastered. For the first time it may be enjoyed in full as a one-off record of, without doubt, some of the greatest voices of that era.